"Where do you do your grocery shopping?" It's true, there are no major grocery stores in the heart of Downtown Memphis, however, there are several stores nearby as well as places to stop into when you need some basic essentials. We do our major grocery shopping at the Kroger located on Union (the one across from Idlewild Presbytarian Church). We have to get in the car to go there, but it's only about a ten minute drive. This is definitely not the nicest Kroger in Memphis. It's small and rather old, but they are in the process of building a brand new one right next door. It will be so nice when that's complete. We've also been known to do some shopping at the closest Walmart, which is in Arkansas. Getting on the highway to do some shopping makes it seem very far away, however, it's only about a 15 minute drive. We go here verrrry infrequently, it's good though to know that it's there, and not that far away. Typically, we find ourselves near a Kroger (there are so many scattered around the area) when we need a gallon of milk or some bread, but there are a few places actually in the heart of Downtown where you can get these things.. without having to drive. There's a Walgreens on Main Street as well as the City Market that have very basic grocery necessities. Also, coming soon, the new Stock & Belle will have a General Store area where they plan on providing these types of essential groceries in the South Main Street area. There you have it. Yes, we live downtown, but we are definitely not cut off from things like grocery stores. 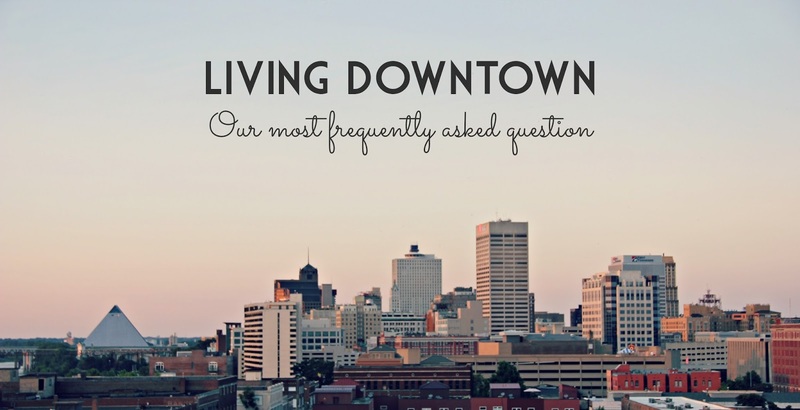 I'm sure there are other Downtowners who have their routines and favorite stores, these places seem to work for us! I also live Downtown and I think getting used to not having a grocery store close was one of my hardest things. Luckily I live on Main St. and have the City Market a block away! Love your blog and the fact you are another memphis lady!